Online High School Credit: Today’s tech-savvy young people spend a great deal of time online communicating with friends and family through social media, keeping up with news, listening to music, watching videos and researching topics for homework. In doing so they are reaping the harvest promised years ago when the digital revolution was in its infancy. They’re fully accepting of the marvels at their fingertips and as such are prime candidates for online high school credit programs like those offered by the Jewish Virtual High School or JVSH. JVHS seeks to expand cultural and educational opportunities for Jewish high school students by providing them the ability to study core OSSD related courses as well as a variety of subjects related to their Jewish heritage online. Students are able to study at their own pace and typically need little assistance getting up to speed with the mechanisms of Internet based learning. The fact is the number of students at every level migrating to Internet study is growing at an exponential rate and for a number of good reasons. Online courses are great for making up credits: It’s all too easy for students today to fall behind in their studies. In the past most would have been “held back”. Today, through online study, many are able to make up lost ground and avoid of the stigma of repeating grades. Online courses are great for overachievers: There’s just no holding back some students and online courses allow highly motivated young people to advance at their own natural rate, not some arbitrary rate imposed by society hundreds of years ago. Online courses are free of distractions: The high school environment can be an enormous distraction for some students causing their focus to wax and wane. On line high school credit courses allow students to find a quiet place where they can better absorb information. Online courses promote research skills: Often, traditional high schools will require students to shut down their mobile devices during class time. With online study they’re able to use these devices to conduct research and develop a deeper understanding of the subject matter. Online courses provide scheduling continuity: Young people from families that travel a lot often lose out on quality education. Online study provides them both flexibility and, just as important, continuity so that they can focus on their school work wherever they are. 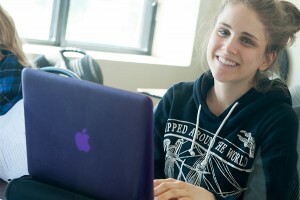 At Jewish Virtual High School we utilize all the above advantages and add the ability for Jewish high school students to study courses tailored to their own unique history and cultural traditions. The icing on the cake is the fact that all online high school credit classes at JVHS are OSSD approved and will become permanent additions to a student’s academic transcripts. If you’re looking for a way to provide your child with a more well-rounded picture of the world and their place in it we encourage you to enrol your Jewish high school student at JVHS today.